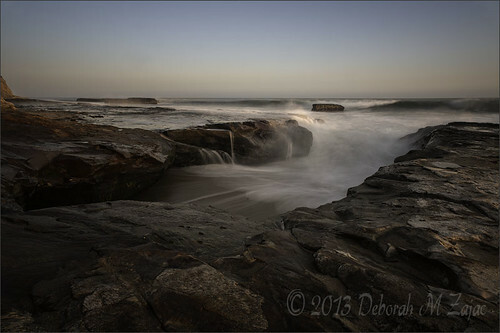 Ebb and Flow, originally uploaded by CircadianReflections Photography. It’s time to head to the coast! My friend Dali and I headed up Hwy 1 to look for a nice spot to photograph the Golden Hour and Sunset. You can’t go wrong driving Hwy 1. There are hundreds of beautiful beaches to see. Here’s last night’s Golden Hour. The tide was rising. I loved watching the ebbing tide drape/cascade over these rocks. The Golden Hour really brought out the red in the rocks as well. It was pretty, and very relaxing listening to the pounding surf.